So you are probably wondering, what is gazpacho? I was curious too; I see it on menus all the time, but I was always too embarrassed to ask. It’s actually really simple – it’s just a chilled soup. It’s the perfect meal on a hot summer day. All you have to do is throw some fruit or veggies into a food processor and that’s it, you have gazpacho. Play around with your favorites and see what interesting combos you can come up with. Add all ingredients above into a food processor and blend until everything is well combined, the consistency of a thick soup. Add a splash of water if needed to thin out the soup. 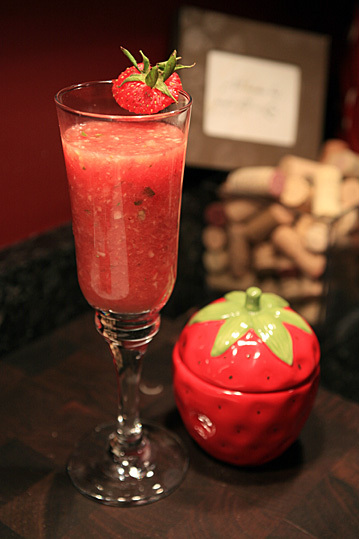 Pour into your serving bowls and garnish with a strawberry on top. Enjoy along side our Walnut Salad with Honey Clementine Vinaigrette.